This article is about the National Historical Park in Atlanta, Georgia. For the memorial in Washington, D.C., see Martin Luther King Jr. Memorial. The Martin Luther King Jr. National Historical Park consists of several buildings in Atlanta, Georgia, including Martin Luther King Jr.'s boyhood home and the original Ebenezer Baptist Church, the church where King was baptized and both his father Martin Luther King Sr. and he were pastors. These places, critical to the interpretation of the life of Martin Luther King Jr. and his legacy as a leader of the American Civil Rights Movement, were included in the park when it was established on October 10, 1980. Formerly a National Historic Site, the unit was redesignated as a National Historical Park on January 8, 2018 by U.S. President Donald Trump. In total, the buildings included in the site make up 35 acres (0.14 km²). The visitor center contains a museum that chronicles the American Civil Rights Movement and the path of Martin Luther King Jr. An 1894 firehouse (Fire Station No. 6) served the Sweet Auburn community until 1991, and now contains a gift shop and an exhibit on desegregation in the Atlanta Fire Department. The "I Have a Dream" International World Peace Rose Garden, and a memorial tribute to Mohandas K. Gandhi are part of the site, as is the "International Civil Rights Walk of Fame" which commemorates some of the courageous pioneers who worked for social justice. Annual events celebrating Martin Luther King Jr. Day in January typically draw large crowds. Speakers have included Presidents of the United States, national and local politicians, and civil rights leaders. Remembrances are also held during Black History Month (February), and on the anniversary of King's April 4, 1968, assassination in Memphis, Tennessee. The Martin Luther King Jr. Historic District, an area bounded roughly by Irwin, Randolph, Edgewood, Jackson, and Auburn avenues, was listed on the U.S. National Register of Historic Places on May 2, 1974. 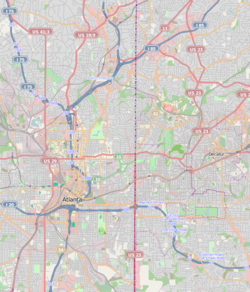 The district included Ebenezer Baptist Church, King's grave site and memorial, Dr. King's birthplace, shotgun row houses, Victorian houses, the Alexander Hamilton House, the Atlanta Baptist Preparatory Institute site, Our Lady of Lourdes Catholic Colored Mission, Fire Station No. 6, and the Triangle Building at the intersection of Old Wheat Street and Auburn Avenue. Much of the area was designated as a national historic landmark district on May 5, 1977. The Trust for Public Land purchased 5 single-family homes along Auburn Avenue in the late 1970s, the same block Martin Luther King Jr. grew up on. The Trust for Public Land purchased more than a dozen properties over the next 20 years to create a parking lot as well as a pedestrian greenway to link the King district to the Jimmy Carter Presidential Center. In 2008, The Trust for Public Land acquired one of the remaining historic properties in the neighborhood, on the corner of Auburn Avenue. By U.S. Congressional legislation, the site with associated buildings and gardens was authorized as a national historic site on October 10, 1980; it is administered by the National Park Service (NPS). A 22.4-acre (91,000 m2) area including 35 contributing properties was covered, including 22 previously included in the NRHP historic district. 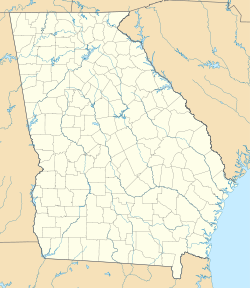 The area covered in the NRHP designation was enlarged on June 12, 2001. In 2018 it was redesignated as a national historical park, adding Prince Hall Masonic Temple to the protected area. 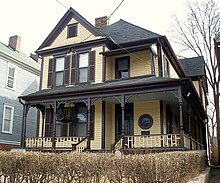 The King Birth Home is located at 501 Auburn Avenue in the Sweet Auburn historic district. Built in 1895, it sits about a block east of Ebenezer Baptist Church. King's maternal grandparents, Reverend Adam Daniel (A.D.) Williams, who was pastor of the Ebenezer Baptist Church, and his wife, Jennie Williams, bought the house for $3,500 in 1909. In 1926, when King's father married Alberta Williams, the couple moved into the house, where King Jr. was born in 1929. The King family lived in the house until 1941. It was then converted into a two-family dwelling. The Rev. A. D. Williams King, Dr. King's brother, lived on the second floor in the 1950s and early 1960s. The first level includes the front porch, parlor, study, dining room, kitchen, laundry, bedroom and a bathroom. The second level includes four bedrooms and a bathroom. The visitor center offers free tours of the house led by National Park Service rangers, but with limited availability. In 1968, after King's death, Coretta Scott King founded the Martin Luther King Jr. Center for Nonviolent Social Change. Since 1981 the Center has been housed in a building that is part of the King complex located on Auburn Avenue adjacent to Ebenezer Baptist Church. In 1977, a memorial tomb was dedicated to King. His remains were moved to the tomb, on a plaza between the center and the church. King's gravesite and a reflecting pool are located next to Freedom Hall. After her death, Mrs. King was interred with her husband on February 7, 2006. An eternal flame is located nearby. Freedom Hall at 449 Auburn Avenue features exhibits about Dr. and Mrs. King, Mahatma Gandhi and American activist Rosa Parks. It hosts special events and programs associated with civil rights and social justice. It contains a Grand Foyer, large theater/conference auditorium, bookstore and resource center, and various works of art from across the globe. The Grand Foyer features art from Africa and Georgia. The paneling lining the staircase is from the sapeli tree, which grows in Nigeria. As of 2006, the King Center is a privately owned inholding within the authorized boundaries of the park. The King family has debated among themselves as to whether they should sell it to the National Park Service to ensure preservation. The visitor center at 449 Auburn Avenue was built in 1996 and features the multimedia exhibit Courage To Lead, which follows the parallel paths of Dr. Martin Luther King Jr. and the Civil Rights Movement. Visitors can also walk down a stylized "Freedom Road". The Children of Courage exhibit, geared towards children, tells the story of the children of the Civil Rights Movement with a challenge to our youth today. Video programs are presented on a continuing basis and there is a staffed information desk. Nonviolence, to be a potent force, must begin with the mind. Nonviolence of the mere body without the cooperation of the mind is nonviolence of the weak of the cowardly, and has, therefore, no potency. It is a degrading performance. If we bear malice and hatred in our bosoms and pretend not to retaliate, it must recoil upon us and lead to our destruction. —  Martin Luther King Jr. The "International Civil Rights Walk of Fame" was created in 2004 and honors some of the participants in the Civil Rights Movement. The walk along the Promenade, includes footsteps, marked in granite and bronze. According to the National Park Service, the Walk of Fame was created to "pay homage to the "brave warriors" of justice who sacrificed and struggled to make equality a reality for all." The new addition to the area is expected to enhance the historic value of the area, enrich cultural heritage, and augment tourist attractions. The "Walk of Fame" is the brainchild of Xernona Clayton, founder and executive producer of the renowned Trumpet Awards and a civil rights activist in her own right. Ms. Clayton said, "This is a lasting memorial to those whose contributions were testaments to the fact that human progress is neither automatic nor inevitable. This historic site will serve as a symbol of pride and a beacon of hope for all future generations. We are looking forward to building a monument to the civil struggle that depicts every step taken toward the goal of justice and the tireless exertions and passionate concern of these dedicated individuals." Located at 332 Auburn Avenue, the Prince Hall Masonic Temple is where the Southern Christian Leadership Conference (SCLC) established its initial headquarters in 1957. This historic and distinguished civil rights organization was co-founded by Dr. King, who also served as its first president. Owned by the Most Worshipful Prince Hall Grand Lodge of Georgia, the building was included within the authorized boundary of the park in 2018. ^ a b "Martin Luther King Jr. Historic District". National Historic Landmark summary listing. National Park Service. Archived from the original on 2009-01-31. Retrieved 2008-06-21. ^ Hallerman, Tamar (January 9, 2018). "Trump signs bill upgrading Atlanta's MLK site". The Atlanta Journal-Constitution. Retrieved 2018-02-06. ^ a b c "Martin Luther King, Jr. National Historic Site". The Trust for Public Land. Retrieved 2018-08-03. ^ Benepe, Adrian (2017-08-18). "Whose Parks, Which History? Why Monuments Have Become a National Flashpoint". Huffington Post. Retrieved 2018-08-03. ^ "Trump signs bill to upgrade Martin Luther King's birthplace to national historic park". USA TODAY. Retrieved 2018-05-22. ^ "The Martin Luther King Jr. National Historic Site and Places that Commemorate His Legacy". Retrieved 30 July 2016. ^ "NPS: Fees and Reservations". National Park Service. July 22, 2008. Retrieved 2009-08-31. ^ "Future of King Center Up in the Air". Jacksonville Free Press. February 9–15, 2006. Retrieved January 9, 2018. ^ "The Martin Luther King Jr. Center for Nonviolent Social Change". Retrieved 30 July 2016. ^ "Visitor Center - Martin Luther King Jr National Historic Site (U.S. National Park Service)". Retrieved 30 July 2016. ^ "The Gandhi Promenade at the MLK National Historic Site". Retrieved 30 July 2016. ^ "International Civil Rights Walk of Fame Announces 2014 Inductees". The Birmingham Times. December 19, 2013. Retrieved February 9, 2018. ^ "Martin Luther King, Jr. National Historical Park Act of 2017, Senate Committee Report" (PDF). Retrieved 2018-01-09. Wikimedia Commons has media related to Martin Luther King, Jr. National Historical Park.